A wide range of industrial applications in nearly all industries can be solved with 3D vision sensors. While 2D vision sensors only measure the x- and y-axes of an object, 3D vision sensors are also designed to measure the z-axis. For this reason, ZF Slovakia decided to use the IVC-3D vision sensor from SICK in a successful application for monitoring clutch discs. ZF Slovakia is a subsidiary of the ZF Friedrichshafen AG Group. In 1915, Ferdinand von Zeppelin founded the company with the original plan of supplying gears for airships and motor vehicles. Today, ZF is one of the three largest automobile suppliers in the world. At the Trnava factory in Slovakia, components for powertrains are produced. One part of the powertrain, the clutch disc, contains several rivets and springs which a machine operator had formerly inspected. Quality control in the assembly line consisted of measuring rivet height, cladding and the parallelism of the springs. However, there were concerns about a specific point where visual inspection proved to be very difficult. That is why ZF Slovakia and SICK spol. s r.o. decided to go for an automated solution for clutch disc monitoring, which aimed to increase efficiency in production and at the same time to ensure quality of the parts. The IVC-3D vision sensor from SICK, which was selected for this application, is capable of detecting the object in the assembly line, even if it is rotating around its own axis. When recording, no start position is defined, and the IVC-3D automatically measures the part. The result is a processed 3D scan where visualization is generated from a computer according to the specific customer requirements. In this application, since a total of five clutch disc types require inspection, the program offers the option of selecting the product type. At the same time, minimum and maximum limit values can be set for every type. Every single disc goes through 32 checks, and the entire test cycle lasts 5 seconds. The evaluation time is less than a second. The results of the scanning process are sent to the computer, where either a green signal displays if the disc is OK, or a red signal displays if the disc is not OK. In this case, production is stopped and the operator needs to take the defective part off the assembly line. ZF Slovakia is very pleased with the quality control solution provided by SICK. 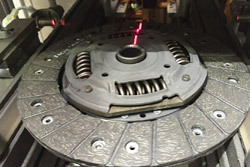 A thorough and reliable clutch disc monitoring system has been realized with the use of IVC-3D vision sensors, and it allows inspection of up to 5,400 discs a day. This means ZF Slovakia saves time and money and has less machine downtime. ZF Slovakia has also chosen to use SICK sensor technology for other applications where the discs are not rotating. The IVC-3D detects the strip in the clutch disc center while it moves on the conveyor belt. With all these applications, the company ZF Slovakia proves that production of first-class products is one of their main priorities. Originally published on SICK Insight Magazine.